Amaranthine`s Pink Delight Bouquet is full of gorgeous blooms, with the long-lasting, non-fragrant pink asiatic lilies, the favorite white carnation and the happy pink gerbera, mixed with lush green foliage. This bouquet will make a wonderful gift for a thank you, thinking of you, birthday, anniversary, I miss you, I love you or our thoughts are with you. 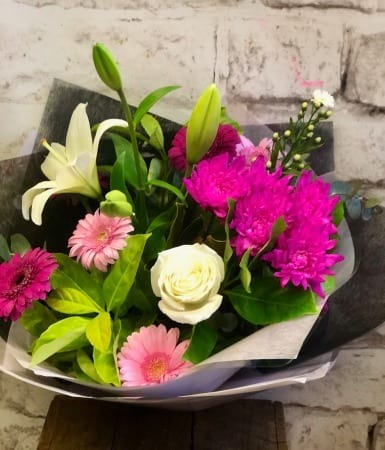 The Pink Delight is a favorite of ours at Amaranthine Flowers By Design, Charlestown Square, Newcastle and is beautifully gift wrapped ans delivered in a convenient temporary vase.